Brian Ernest Orser, OC (born 18 December 1961) is a Canadian former competitive and professional figure skater. He is the 1984 and 1988 Olympic silver medalist, 1987 World champion and eight-time (1981–88) Canadian national champion. At the 1988 Winter Olympics, the rivalry between Orser and American figure skater Brian Boitano, who were the two favorites to win the gold medal, captured media attention and was described as the "Battle of the Brians". Orser turned professional in 1988 and skated with Stars on Ice for almost 20 years. As a coach, he has led both Yuna Kim (2010) and Yuzuru Hanyu (2014, 2018) to Olympic titles. He also coached Javier Fernández to Olympic bronze (2018) and the 2015 and 2016 World titles. He is a Skating Consultant at the Toronto Cricket Skating and Curling Club. Brian Orser was born in Belleville, Ontario. He grew up in Penetanguishene. He is the youngest of five children. Orser won his first national title on the novice level in 1977. The following season, he went to Junior Worlds and placed 4th, behind eventual rival Brian Boitano. He added a second national title, this time at the junior level, to his resume in 1979. In 1980, he moved up to the senior level. He won the bronze medal at his first senior international, the Vienna Cup, and then placed 4th at the Canadian Figure Skating Championships. That was the last time he would place off the podium at the national level. 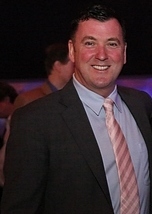 In the 1980-1981 post-Olympic season, Orser began making his mark on the skating world. He won the silver at the Nebelhorn Trophy, placed 6th at Skate Canada, and then won his first of eight National titles. In his debut at Worlds, he placed 6th. The next season, he won his first medal at Skate Canada and moved up to 4th at Worlds. He won his first World medal in 1983, a bronze, positioning him well for the 1983-1984 Olympic season. Orser became the second man to land the triple Axel when he performed it in winning his Canadian junior title in 1979, at a time when few senior skaters were even attempting it. Over the next few years, Orser performed the jump more frequently and more consistently than any other skater of the time. Orser became the first man to land the triple axel at the Olympics when he landed it in his free skate at the 1984 Winter Olympics. He won the silver medal behind Scott Hamilton, and then won the silver at 1984 Worlds, again behind Hamilton. Only Orser's low placements in the compulsory figures prevented him from winning both titles. In the 1984-1985 season, after Hamilton's retirement, Orser was seemingly poised to become the dominant champion. However, he had an imperfect worlds, and placed second to Alexander Fadeev, who also had the triple axel in his repertoire. Orser resolved to begin including two axels, not just one, in his free skate, in order to give himself an advantage over Fadeev. He finally won Worlds in 1987. At that competition he became the first skater at the World Championships to land two triple axels in the free skate and three in the same competition. Going into the 1988 Olympics, Orser worked with a sports psychologist on visual imagery. He and Brian Boitano were thrust into the Battle of the Brians, each being the other's main rival. Orser was undefeated in the 1986-1987 season and had not lost a competition since losing to Boitano at the 1986 Worlds. At the Olympics, Orser served as the flag-bearer for Canada during the opening ceremonies. He placed 3rd in compulsory figures segment of the competition, 1st in the short program, and second in the free skating, winning the silver medal overall. Brian Boitano won the gold medal, defeating Orser by .10 of a point. He won the silver again at Worlds in 1988, after winning the free skate. Orser turned professional following that season. He had not placed off a podium at any competition since 1982. During his competitive career, he trained at the Mariposa School of Skating, originally located in Orillia, Ontario and was moved to Barrie, Ontario in 1988. The Brian Orser arena is also located in Orillia. Orser began touring with Stars on Ice in 1988, soon after ending his competitive career. He would go on to appear with them on and off for nearly 20 years, skating his last with the show in 2007. Orser starred in the 1990 German skating dance film Carmen on Ice, alongside his archrival Brian Boitano and Katarina Witt. The film told the story of Carmen wordlessly through ice skating; Orser played the part of Escamillo. 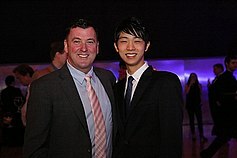 Orser with Yuzuru Hanyu in 2015. Orser with Yuna Kim in 2007. Orser with Christina Gao in 2010. He is the head instructor at the Toronto Cricket Skating and Curling Club along with Tracy Wilson. Jason Brown - began coaching in summer of 2018. Gabrielle Daleman - began coaching her in the spring of 2015, coached her to win bronze at the 2017 World Championships. Javier Fernández - began coaching in mid-2011, coached him to win the bronze medal at the 2018 Winter Olympics, the 2015 and 2016 World Championships titles and to become the 7-time European Champion (2013-2019). Yuzuru Hanyu - began in April 2012, coached him to win the 2014 and 2018 Olympic titles, the 2014 and 2017 World Championships titles, and 4 golds at Grand Prix of Figure Skating Final from 2013-2016. Elizabet Tursynbayeva - began in 2013 to June 2018. Fedor Andreev - began coaching him in the fall of 2007 (Andreev had since switched to ice dancing). Sean Carlow - in 2007 and 2008. Alaine Chartrand - part-time, began coaching her in August 2014. Phoebe Di Tommaso in 2007 and 2008. Christina Gao - from 2009 to 2012, coached her to win bronze at the 2009 Junior Grand Prix Final. Elene Gedevanishvili - began in mid-2011 to summer of 2013, coached her to win the 2012 European bronze medal. Joshi Helgesson - began coaching her in 2016. Yuna Kim - March 2007 to August 2010, coached her to win the 2009 World Championships and 2010 Olympic gold. Rachel Kirkland / Eric Radford - 2005 to 2009. Kwak Min-jeong - February to August 2010. Sonia Lafuente - began in October 2013 to 2014. Rylie McCulloch-Casarsa - coached her from 2006 to 2011. Nam Nguyen - began coaching him in the summer of 2012 to the spring of 2016, coached him to win the 2014 World Junior Championships. Adam Rippon - December 2008 to March 2010. Yun Yea-ji - worked with her in the summer of 2008 and summer of 2009 through September 2010. Orser was named a Member of the Order of Canada in 1985 and promoted to Officer in 1988. Orser, along with his two co-stars, won an Emmy Award for his performance in Carmen on Ice after it appeared on HBO. Orser is openly gay. He was forced to reveal his sexuality in November 1998, when he lost a legal battle to prevent public disclosure when an ex-partner sued him for palimony. Orser initially feared the revelation of being gay would ruin his career, but he has since embraced support from other skaters and the public. Since 2008, he has been in a relationship with Rajesh Tiwari, a director of The Brian Orser Foundation. Justice Harvey Brownstone, Canada's first openly gay judge, officiated at their wedding ceremony. Beisteiner, Johanna, Art music in figure skating, synchronized swimming and rhythmic gymnastics / Kunstmusik in Eiskunstlauf, Synchronschwimmen und rhythmischer Gymnastik. PhD dissertation, Vienna 2005 (German), Austrian Library Network Catalogue. The dissertation contains an extensive description and analysis of Carmen on Ice (Chapter II/2, pages 105-162). ^ a b Janofsky, Michael (15 February 1988). "Orser, Boitano On Two Paths To Same Goal". The New York Times. ^ Smith, Beverley. Figure Skating: A Celebration. p. 149. ISBN 0-7710-2819-9. ^ Orser, Brian. A Skater's Life. pp. 135, 162. ISBN 1-55013-126-5. ^ "Jason Brown Announces Coaching Change". May 29, 2018. ^ Hersh, Philip [@olyphil] (29 April 2015). "Gabrielle Daleman- Coaching Change" (Tweet) – via Twitter. ^ Yaneva, Veneta (15 May 2014). "Brian Orser: "Yuzuru and Javi are different, but help each other"". Absolute Skating. ^ "Michaela DU TOIT". International Skating Union. Retrieved 14 April 2015. ^ "Javier FERNANDEZ". International Skating Union. Retrieved 16 October 2015. ^ a b Golinsky, Reut; Geikhman, Tatiana (29 October 2011). "Brian Orser: "I'm a little bit tougher"". Absolute Skating. Retrieved 8 November 2011. ^ a b Pyette, Ryan (11 March 2013). "Brian Orser's skaters set to challenge Patrick Chan". Vancouver 24 hrs. The London Free Press. ^ Rutherford, Lynn (19 October 2012). "Orser amazed by pupil Hanyu's skill, politeness". IceNetwork. ^ "World bronze medalist Hanyu switches to Orser". IceNetwork. 25 April 2012. ^ "Fedor ANDREEV". International Skating Union. Retrieved 29 October 2009. ^ "Sean CARLOW". International Skating Union. Retrieved 29 October 2009. ^ Slater, Paula (23 August 2014). "Chartrand readies for Grand Prix debut". Golden Skate. ^ "Phoebe DI TOMASSO". International Skating Union. Retrieved 15 June 2010. ^ "Christina GAO". International Skating Union. Archived from the original on 16 August 2011. Retrieved 29 October 2009. ^ Rutherford, Lynn (22 July 2013). "'Gladiator' Manella ousts 'Zorro' Messing in Aston". IceNetwork. ^ Brodie, Robert (August 6, 2018). "STEPHEN GOGOLEV: CANADA'S NEXTGEN STAR". International Figure Skating. ^ Hellman, Linus (20 July 2016). "Joshi Helgesson flyttar till Kanada". sla.se. ^ "Yu-Na KIM". International Skating Union. Archived from the original on 27 May 2010. Retrieved 29 October 2009. ^ "Orser no longer coaching Olympic Champion Kim". Figure skaters online. 23 August 2010. ^ "Rachel KIRKLAND & Eric RADFORD". International Skating Union. Retrieved 29 October 2009. ^ "Min-Jung KWAK". International Skating Union. Retrieved 25 March 2010. ^ "Kim Yu-na's Breakup with Orser Ends Training for Kwak Min-jung". The Chosun Ilbo. 25 August 2010. ^ "Sonia Lafuente abandona España para trabajar con el entrenador de Javier Fernández" [Sonia Lafuente leaves Spain to train with Javier Fernandez' coach]. EFE (in Spanish). 20minutos.es. 9 October 2013. Archived from the original on 5 December 2013. ^ "Sonia Lafuente entrenará con Brian Orser" [Sonia Lafuente will train with Brian Orser]. Hielo Español (in Spanish). 9 October 2013. Archived from the original on 5 December 2013. ^ "Sonia LAFUENTE". International Skating Union. Archived from the original on 6 July 2014. ^ "Rylie MCCULLOCH-CASARSA". International Skating Union. Retrieved 29 October 2009. ^ "Adam RIPPON". International Skating Union. Retrieved 29 October 2009. ^ "Two-time World Junior Champion Adam Rippon announces coaching change". U.S. Figure Skating. 1 April 2011. Retrieved 8 November 2011. ^ "Yun YEA-JI". International Skating Union. Retrieved 15 June 2010. ^ "Carmen on Ice (Awards & Nominations)". Emmy Awards. 1990. Retrieved 30 August 2017. ^ Elliott, Helene (13 March 2009). "Brian Orser heads list of World Figure Skating Hall of Fame inductees". Los Angeles Times. Retrieved 8 November 2011. ^ "Brian Orser". Ontario Sports Hall of Fame. 22 April 2014. Retrieved 25 September 2014. ^ "Ready, set, come out". The Advocate. 2 February 1999. ^ Crary, David (20 November 1998). "Skater Brian Orser loses fight to suppress ex-boyfriend's suit". Associated Press. Canoe.ca. Archived from the original on 23 July 2012. Retrieved 8 November 2011. ^ Flett, Ted (18 January 2012). "Being Brian Orser". Daily Xtra. "Skate Canada Results Book - Volume 2 - 1974 - current" (PDF). Skate Canada. Archived from the original (PDF) on 20 September 2009. "Canadian National Championships Medallists" (PDF). Skate Canada. Archived from the original (PDF) on 20 September 2009. Evans, Hilary; Gjerde, Arild; Heijmans, Jeroen; Mallon, Bill. "Brian Orser". Olympics at Sports-Reference.com. Sports Reference LLC. Wikimedia Commons has media related to Brian Orser. This page was last edited on 3 April 2019, at 11:17 (UTC).